On Sunday, I had the good fortune to meet a fellow van dweller and traveller, Jeff, from the north east of England. I'd stopped at a wild camping location and had a chat with him over a cup of tea in the sunshine. At nearly six years into the lifestyle, Jeff wasn't looking back, and was enjoying his second winter on the Portuguese south coast. Like many of us, Jeff had become disillusioned with the rat race, and decided to try a different, more liberated lifestyle. Not to mention the economic advantages. 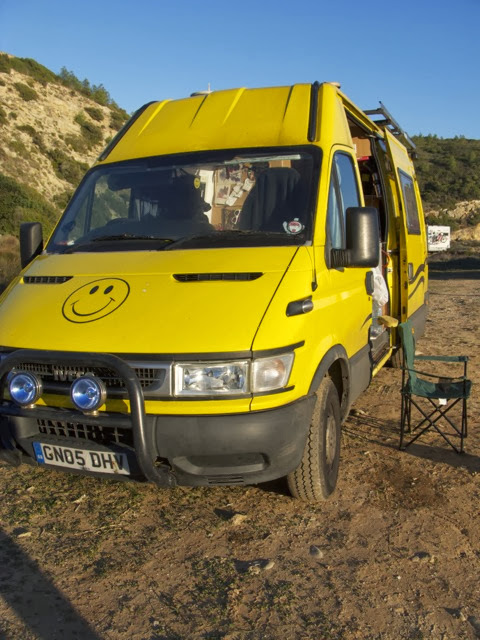 He'd first hit the road in a Navara pick-up and caravan combination, but soon decided a van was the way to go - its easier to blend in, and opens up more possibilities for camping spots. 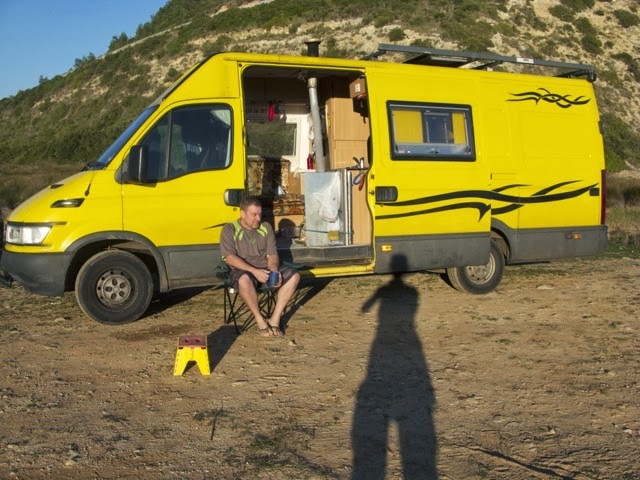 This was now his second van, a 2004 Iveco which he'd converted himself, putting time and love into the project. With even a brief look over the outside of the van you can see he's done a great job, fitting caravan windows in the sides, and some tribal graphics to set off the yellow paintwork, and add more character to his vehicle. Maybe not so obvious is the solar panel arrangement on the roof rack, similar to my own from which Jeff can keep his house batteries topped up when stopping over for a few days in one place. An Iveco van is very spacious and a good quality vehicle for a camper van conversion, especially if you want room for all your comforts and extra storage. Jeff said it was also possible to do a 4WD conversion to this model which would certainly be worth it under certain circumstances. It is possible that you'll get stuck on sand or softer surfaces when finding a wild camping spot, and that'd help you out. Taking a seat on the sofa, opposite the side door was really comfortable and looking out onto the southern seas I could tell why Jeff had the phrase, "This is my Church" stencilled on the wall above the window. Its a wonderful place to sit reading or just enjoying the view hour on end. 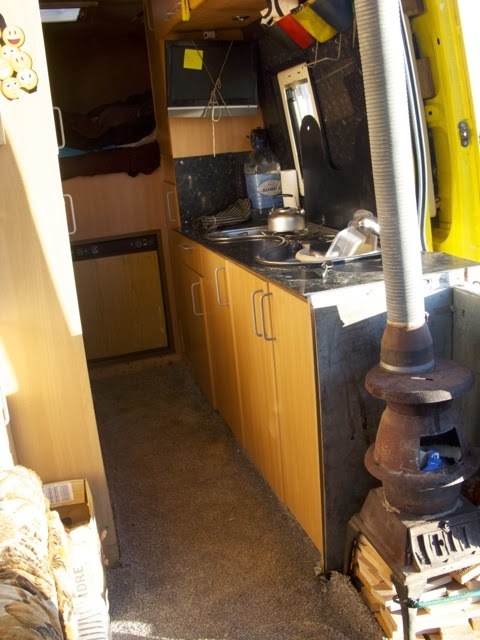 All the kitchen units came from Ikea, and he'd also installed a stylish three ring gas burner and sink combo. The bathroom and shower are situated on the left of this picture, behind a matching door. As you can see, sitting here, you're right beside a wood burner, so as the evening draws in, get it stoked up and enjoy the sunset before dinner. If you're wondering, Jeff told me he got this pot-belly stove from Machine Mart for a good price and like with everything else, installed it himself. If you look back at the top photograph, you'll see the flue pipe going directly through the ceiling above the stove. 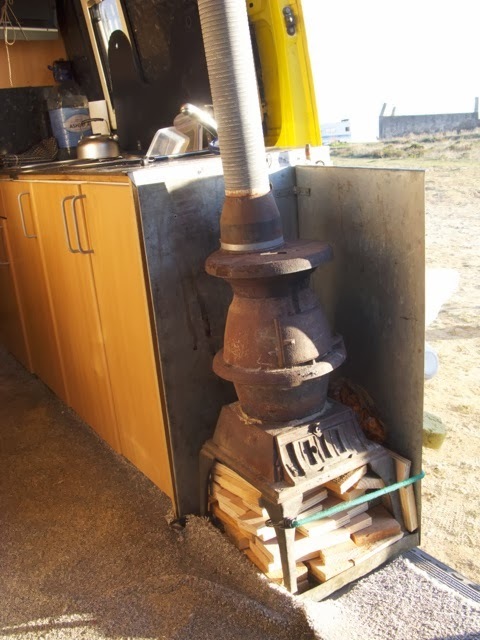 I'm always envious of people with wood burners in their vans. There's room for a big bed at the back running across the width of the van, and being up high like that makes for a cosy nest. 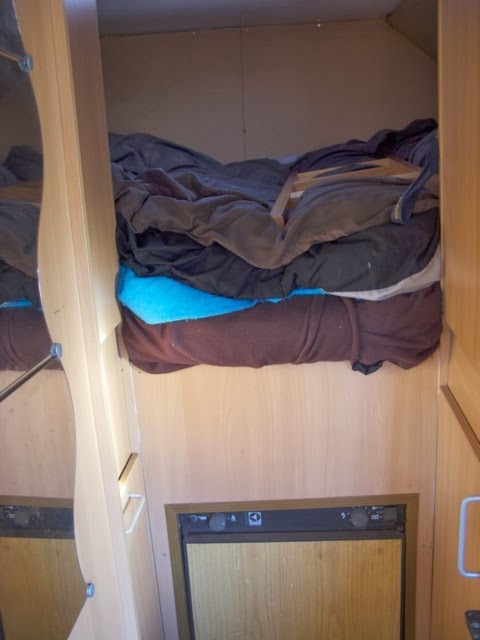 The bed is surrounded by matching wood effect formica in keeping with the rest of the van. The three way fridge fits perfectly in the space below the bed, and he even has room for a full length mirror, seen on the left here. Plenty of storage too of course. 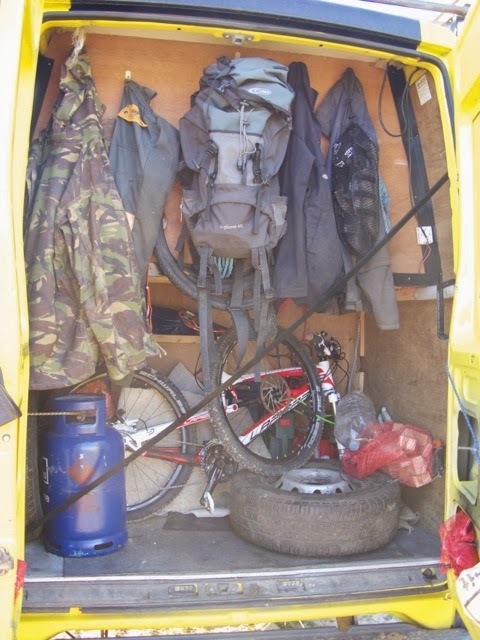 There is so much space in this Iveco, that even considering all the living space, there was still room for a 'garage' at the back for all Jeff's tools, spare wheels, gas cylinders and his mountain bike, as well as his outdoor clothing and hiking equipment. I was really surprised when he opened the back to show me the storage space - imagine having a space like this in the Hiace! I mentioned earlier that there is a bathroom in the Iveco, with shower and toilet. Well, Jeff also showed me his solar shower set up. He has a section of the roof painted black to make the heating of the solar shower more efficient, and climbs up the rear ladder to put it up there. I've always wondered if solar shower bags were much good, but he was really enthusiastic about them, saying that the water even has to be cooled with some cold sometimes before he can use it. I might think about one of these, especially now that I'm living in a warmer climate myself. We had an enjoyable afternoon, sitting chatting, drinking tea and watching the coming and going of other campers and motorhomes, sharing travellers stories, and discussing some of the more unusual people and vehicles that we had come across. Jeffs planning to be around for the next couple of months, so I do hope our paths cross again soon, and if you see him yourself, on the road, be sure to give a friendly wave and a smile. Thanks Jeff for your company, hospitality and the van tour. Thanks too for the English tea bags - I was missing a good brew! Remember to share or like the page on FB, G+ or whichever you use, thanks! The perm bed setup might swing it for us - Although we love nipping about in smaller vehicles. Did you have any dilemmas deciding which motor was the right fit for you? I didn't have much of a dilemma - when I saw this one I knew it was perfect for me, and then its grown over time as well. As for choosing yourselves, a few things to consider. A smaller vehicle is always going to be more manoeuvrable whilst sacrificing on space. For more than one person space is really important - spending so much time in mine with all my gear, its just perfect for one, but if its just for trips its fine for two. Since I've got more into the 4x4 aspect of it all of course - it sways me much more towards a Hiace or similar as theres much greater scope in what I can tackle than in a bigger van. Whats the change you are thinking of making? We've down sized enough to be living out of a couple of suitcases for a job overseas at the moment - and realized quite how much stuff packed up in the UK we don't need. Blighty, but, the more we thought about setting down roots again with bricks and mortar the more the flexibility of a "go anywhere" live in vehicle began to appeal. Because we've not used the contents of our home for over a year, and not really missed any of it, we'd like to continue to live lighter and with less baggage -emotional and physical. Your story is keeping our spirits buoyed as we read it in West Africa Chris. Top work. Wow! It sounds like you are on the brink of starting out on a new adventure! There's generally less to worry about with less stuff, and of course with living being cheap, if you are working then the money is always there to go back to a more 'conventional' lifestyle if you ever feel like another change. I can say too, that after a while in a van, it becomes the new normal, and the thought of moving into a house becomes a strange and not always so appealing one. Though some day it could be just the exciting new change I need, lol.